Eddie thinks nothing ever happens in his small, boring town. Every day is exactly the same, down to what the bus driver will say when he picks each kid up in the morning. But then, one day, someone new, and very pretty, walks onto the bus. At least, Eddie thinks she’s new, but there is something oddly familiar about Scarlett. Intrigued (and smitten), Eddie starts to follow Scarlett—and what he discovers is odder still. 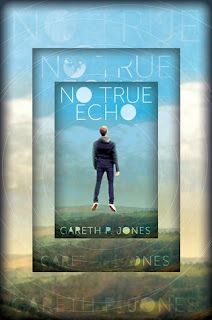 Scarlett is a Senior Echo Time Agent from the future, come to his town to investigate the origin of time travel, which, unbeknownst to Eddie, was invented right in his hometown, by someone he knew. Soon Eddie is swept up in the investigation and in time. But time travel is a dangerous business, and Eddie will learn more than he wants to know about his long-dead mother. This psychologically rich thriller redefines the time travel novel for a teen audience.